Charged up. 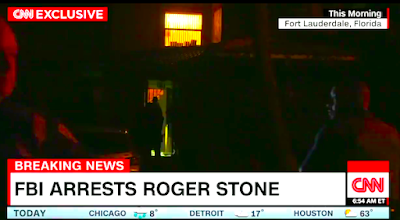 Updating coverage: One of President Trump’s closest pals, Roger Stone, has been arrested—accused of lying to Congress and obstructing the special counsel’s Russia investigation. ■ Vox explains the arrest of Stone—a big fan of Richard Nixon. ■ Read the indictment, complete with a Godfather: Part II reference. ‘Be a snitch, a squealer, a rat.’ A Sun-Times editorial delivers a message to aldermen who see criminal conduct among their comrades. ■ Mayoral candidate Susana Mendoza has changed her mind about campaign cash she got from Solis. ■ The redeveloper of Chicago’s Old Main Post Office has been helping prosecutors build a corruption case against Ald. Ed Burke. Ticketmasters. All of those still on Chicago’s mayoral ballot have committed to reforming the city’s vehicle ticketing system so it stops screwing low-income and minority residents. ■ ProPublica and WBEZ have created a Facebook group for people to share ticketing horror stories. ■ Candidate Toni Preckwinkle pledges to replace lead lines delivering water to Chicago homes. ■ Politico takes a microscope to one of Chicago’s most contested aldermanic races. A fresh start? Cook County State’s Attorney Kim Foxx says it’s time to legalize marijuana—and wipe the record clean for those convicted of pot misdemeanors. ■ See video of her speech yesterday to the City Club of Chicago. ‘When City Hall rubber-stamps projects that will forever change communities, the city loses.’ A Tribune editorial condemns the Chicago Plan Commission’s fast-track approval of the massive Lincoln Yards development for Lincoln Park and Bucktown. ■ Florida’s elections chief has quit after a newspaper revealed photos of him in blackface at a 2005 party—dressed as a Hurricane Katrina victim. Flying? Maybe not. The FAA blames the government shutdown for delays at major airports in the northeast. ■ How you can help those TSA workers not getting paid. ■ Also crippled: Government approval of hundreds of potentially life-saving medical devices. ■ The New York Times: How House Speaker Nancy Pelosi bedevils the president. The news biz plight. An outstanding historical perspective on all those reporter layoffs—as laid out by a Lehigh University prof … on Twitter. ■ Employees at Business Insider’s sibling site Insider have been banned from using Twitter next week. ■ Comedian Patton Oswalt ended a Twitter spat with an act of kindness. ■ Facebook plans to smoosh WhatsApp, Instagram and Facebook Messenger into a single thing. Just don’t. The Trib’s Mary Schmich lists 8 things you must never, ever do when it’s really, really cold in Chicago. ■ Chicago’s weekend forecast: First cold and snow … and then really cold. ■ Robbers in downtown Chicago are taking people’s Canada Goose jackets. ■ … to Amy Savin Parker for inspiration this issue. ■ … to those who support Chicago Public Square for a few cents an issue. How about you?